Sydney / Kilchberg, July 07, 2016 – Lindt & Sprüngli Australia (Lindt) has officially opened its new $60 million purpose built facility at Marsden Park in Sydney’s west on July 04, 2016 as it expands its operations to capitalise on the chocolate makers strong growth in the Australian market. The Marsden Park facility will employ up to 350 staff, with approximately 80 per cent of those from Sydney’s western suburbs which sits at the heart of the Western Sydney growth corridor. 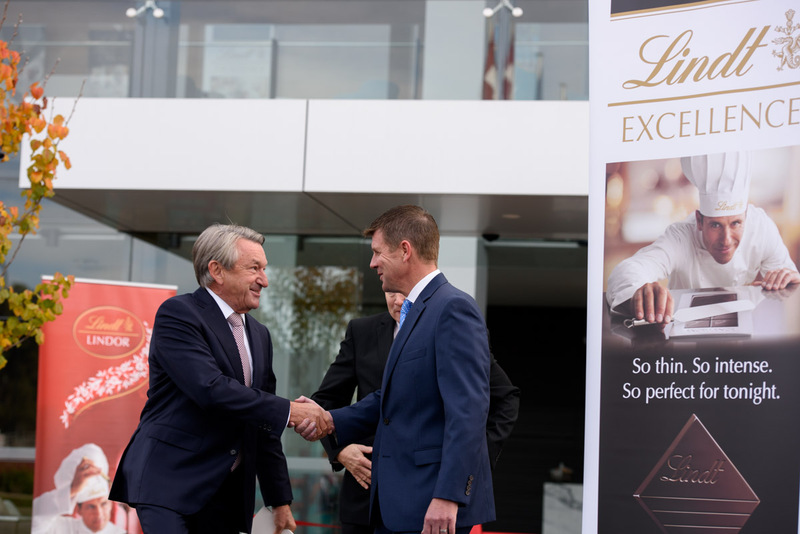 Lindt & Sprüngli’s Group CEO Ernst Tanner, who is visiting Australia for the milestone event, said that the company’s decision to enter the Australian market nearly twenty years ago has proven to be one of the most successful ventures in the company’s history. “Never did we anticipate the reception that Lindt chocolates would receive in Australia when we first entered the market here. I am delighted that the growth of our business in Australia has allowed us to not only expand our operations but to provide people in Sydney’s West with employment opportunities with Lindt”, said Mr Tanner. The purpose-built facility covers a 66,000 square metre site, with over 25,000 square metres of factory and warehouse space, and forms part of the $2.9 billion investment in the Sydney Business Park which will host a range of retail and recreational businesses. This month the Lindt factory began spinning a new range of Lindt Easter eggs which will be available to the public in Easter 2017 using chocolate imported from Switzerland. “The fact that we are spinning a new product specifically for the Australian public is a reflection on the many successes we have had here. The team at Lindt Australia is eager to share the new Easter egg and we know that Australia will love it as much as we do,” said Mr Tanner. The new range of Easter eggs will complement the iconic success of Lindt’s Gold Bunny.